This year, we are proud to celebrate 10 years of providing quality pediatric therapy services in Chicago. Our community of neighbors, parents and children have become an extension of our Lumiere family. We pride ourselves on making your family goals, our goals. In fact, when we started out, we set a special goal of our own, which became our VISION: To create, capture and celebrate 100,000 magic moments by the year 2020. Magic Moments are every small step, every little success and tiny milestone met, that makes a big impact on the lives of children and families in meeting their family goals. This includes you - the parents and guardians who entrust us with the developmental care of your children - as well as our community partners and amazing team of therapists, admins, billing specialists, ancillary teams and interns for their dedication and unparalleled service. We work with the state program! We offer infant PT and mom/tot classes as well as a yoga series for kids. 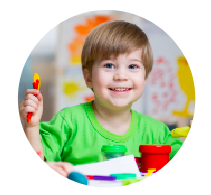 Did you know we can work with your child’s school? We welcome referrals. "Ten years ago, when I started Lumiere Children’s Therapy, I wanted to make a difference by lessening the burden of uncertainty and anxiety that comes along with having a child that learns differently. I soon realized that every little success is truly a magic moment that should be counted and celebrated. I am eternally thankful to my amazing staff, who strive to give light to this vision - it's a blessing to see how our clinicians touch the lives of your children. Most of all, I am thankful for you, our families, who entrust us with the developmental care of your children every day. You are all part of our family." Fun things you can do as a family! Walk! Don’t Drive - skip the car ride and take a walk instead. Explore nature by collecting fallen autumn leaves and compare them. How are they different? Why? Cook Together - have your kiddo help with dinner by stirring, pouring and measuring out ingredients. Game On - designate a family game night and try a different board game or join in their pretend play. Kids love it when you take part in their activities. Create Art - bring out the craft bin and add paints, crayons or markers and create your own family masterpiece - then display it! Show Time - put on a family talent show by dressing up, and showcase your singing, dancing or magic show abilities! Sign up for a FREE trial class to one of our enrichment groups!